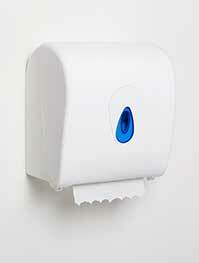 The Modular Autocut hand towel dispenser is ideal for environments where hygiene is paramount. 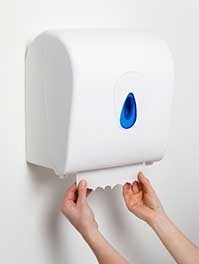 The system delivers pre-measured flat sheets of paper towel ready to use, minimising the risk of cross contamination as only the paper is touched not the dispenser. 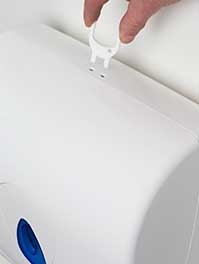 This low maintenance mechanical dispenser can fit almost all types of paper rolls – 1ply, 2ply, 3ply. 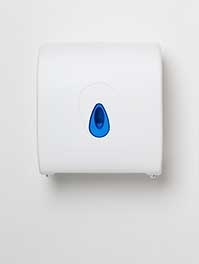 By default, the Modular hand towel dispensers come with a blue window. However, a set of coloured windows and branding options enable full product customisation to match a company's brand. These features are available for the entire Modular range. The smallest drying service (pre-measured towel sheet length) in the market - 9"